This week has been a bit of a mess inside my head. I thought my symptoms were lessening during the week, so I am now convinced that the remaining baby passed about mid-week. 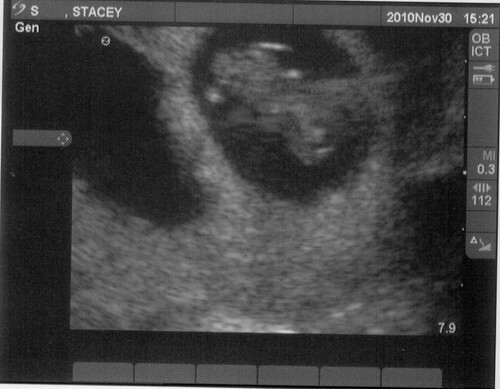 I realize symptoms can come and go, and some people don't even get any symptoms until weeks after this point, if at all, but these 1.5 week gaps between ultrasounds leave me enough time to imagine the worst.... despite any evidence to the contrary. I was trying to explain to Ryan that I thought I had lost the baby since all of my symptoms had disappeared, although I had to pause while telling him this to try to get my nausea under control. :-\ If I do decide to acknowledge my symptoms, then I can also convince myself that they're all just a side-effect of the progesterone and estrogen meds I'm still taking - which is entirely possible, but hopefully at least some of this is still being caused by a growing baby. 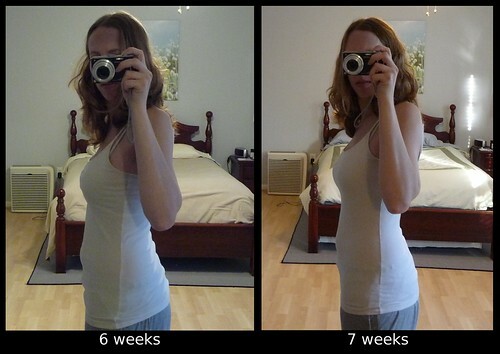 I thought the bloating had gone down some mid-week, although I realized that that was probably just because I was wearing some work pants that are a bit looser around the waist, because when I tried to put on my non-loose jeans the next day, I was right back to being uncomfortable and constricted. 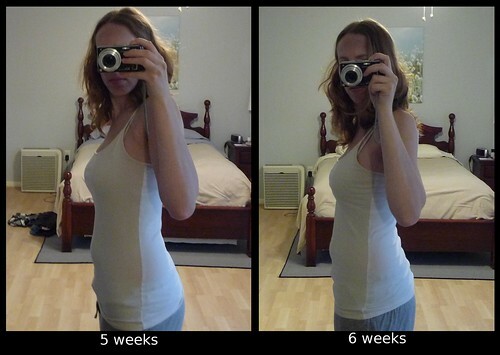 I also realize that bloating usually goes down a bit before the real baby belly starts, but I've just been clinging to my symptoms as a security blanket so much that I don't want any of them to go. In fact, although the low-level nausea was back most of the day yesterday, today is the first day in weeks that I haven't put on my Sea-bands because I *want* to feel the nausea. A bit twisted, perhaps, but it's not bad and it provides me with some comfort. 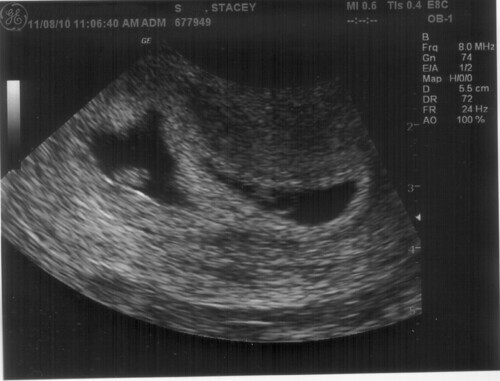 And if I go in for my next ultrasound on Tuesday to find out that I lost the second baby too, at least then I have a few more feelings and memories to hold onto for what it felt like to be pregnant again. I've also still been dealing with a stuffy nose (one of the first symptoms I had, starting the day I got my first positive HPT at 3w3d! ), which has been fine, except now it feels like it's starting to develop into a cold. Sleep has also been a struggle for me the last few weeks. I'm not sure how much of that I can blame on the time change three weeks ago or the pregnancy, but I've been waking up about every half hour from 6:30 on... extremely frustrating, especially this week since I had a couple days off work so I was hoping to catch up on some sleep, and instead I was up by 9:30 every day except Friday, when I managed to power through a few hours of crappy sleep and actually got a few more solid hours of sleep in, waking up after noon for the first time in ages. The craving of the week continues to be hamburgers, although that's starting to taper off now after 3 hamburgers in a week. I also ate mac n' cheese yesterday, and the cheese actually tasted sort of... good. I'm confused by that, given my long-standing dislike of cheese. 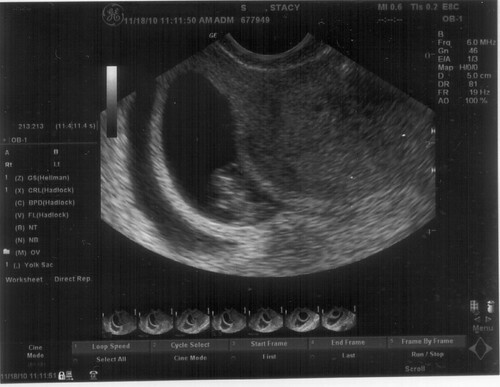 Obviously, this week was Thanksgiving, which was a point of concern for us, since we're not planning on telling everyone until Christmas, when I'll hopefully be 13 weeks. To throw everyone off the trail, I actually drank some beer at Thanksgiving... or at least, I drank out of a beer bottle ;) We had replaced some Yuengling with near-beer, which wasn't my favorite, but at least crappy pilsners just taste like glorified water anyway. It sometimes seems a little strange that we're going to such lengths to avoid telling people early - especially our families - but we're doing this for a couple different reasons, with the main one being I don't want everyone to get too excited this early, since we've had such a rough time getting and staying pregnant. Especially with some younger kids involved, I would just rather wait until second trimester to tell everyone to hopefully avoid the awkwardness and sadness of having to untell everyone. I've made it to 6 weeks now. 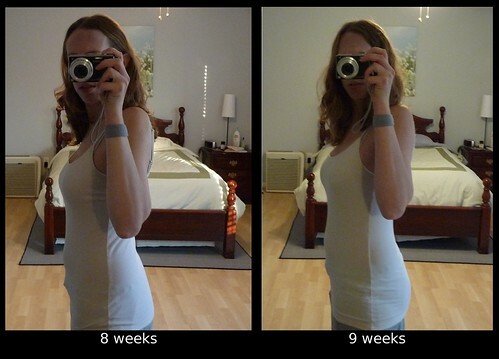 The bloating seems to have lessened a bit, although this week I started having some issues with nausea, smell sensitivity and food aversions. All of which made eating not a very fun experience. I was planning on continuing with my lunches of a salad and fruit to help counteract my full dinners and ice cream/cheesecake desserts, but suddenly the mere thought of a salad is turning my stomach. Normally I fluctuate about 5 lbs each week (starting the week at the heaviest after a weekend of eating out, and then ending at my lightest on Friday), but this week I held pretty steady at my normal Monday weight all week. Not being able to eat salads will not help with this issue. My whole meal schedule has also been thrown off the last couple of weeks - normally I eat breakfast around 9:30-10:00, then eat lunch around 1:30-2:00, and then dinner around 6:00-7:00. Now I'm lucky if I make it to 9:30, and then my stomach is growling by 11:30... I can usually fight it off until 12:30, but then I'm starving again by 3:00, so I've had to add a mid-afternoon snack now. So far either a banana or some greek yogurt is sufficing, and I guess that replaces my daily Mountain Dew, from any "extra" calorie standpoint anyway. And who knew finding a tea I could drink would be so hard? I have a stash of about 6-7 kinds of tea at work, and while some of them were automatically excluded because they're caffeinated, I thought the remaining decaf teas (green, apple spice, dandelion, and elderberry/blackberry) would be fine. But then I read to avoid green tea while pregnant (although it wasn't entirely clear if that was under the assumption that it was caffeinated), and then both the apple spice and elderberry/blackberry teas have hibiscus in them, which I'm apparently also supposed to avoid. The dandelion tea literally had just dandelion in it, and that didn't seem to have any dire warnings about it, so at least I could have that. There are three items that I use on almost a daily basis - a water bottle, a plastic container for salad (although this may no longer be an issue if I can't stomach salad), and styrofoam cups for my oatmeal. The one water bottle is no longer cutting it, so I started looking into getting a bigger one, which then led into researching the dangers of plastic. So now I'm worried about the one I do use (which is metal of some sort for the body but then has a plastic top), since I haven't found a good metal or glass one to replace it yet. It's never been heated though, and although the top is scratched a bit from washing, hopefully it's ok in the interim. The plastic container is supposedly fine (since it's #2), but I'm still worried since it's been used/washed nearly daily for a couple of years and it is pretty scratched up, which apparently helps with leaching. I tried switching to a glass container, but then have the same problem with the cover being plastic (and it didn't have the number listed on it). And now finally - finally! - I'm apparently motivated enough to try to get away from using the styrofoam cups for my oatmeal. The fact that I use and throw away styrofoam every day is something I've felt guilty about for years, but apparently not guilty enough to actually remember to bring a bowl to use. So far I've remembered to bring a glass bowl from home for one day, and hopefully I'll remember to keep doing this next week too. 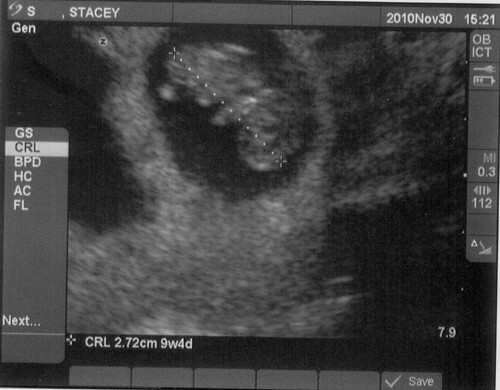 The first ultrasound is on Monday, and I've moved away from just pure excitement to a mix of excitement and worry now. It turns out Ryan's going to be on an airplane at the time of my appointment, so now I'm disappointed that he's going to miss the big reveal of how many we have in there, and I'm also worried that if I have a blighted ovum (or two), that I'm going to have to deal with that on my own again, since I had gone to the ultrasound on my own during my first pregnancy when we found out the baby had stopped growing. But there's not much we can do about it anyway, and having Ryan there or not won't affect what's going on inside me, so I'll just keep my fingers crossed for good news that I can share with him as soon as he lands. 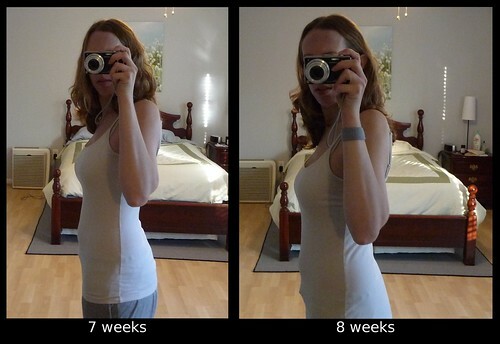 Below is my first official weekly comparison pic, although there's not much belly-wise to compare, so instead I'm more admiring the fact that there's no clothes on the ground for the 6 week pic and I got one side of my hair relatively tamed at least ;) As I mentioned, the bloat seems to have lessened somewhat, but it looks like it somehow got more concentrated into a narrower ring across my belly. Weird.